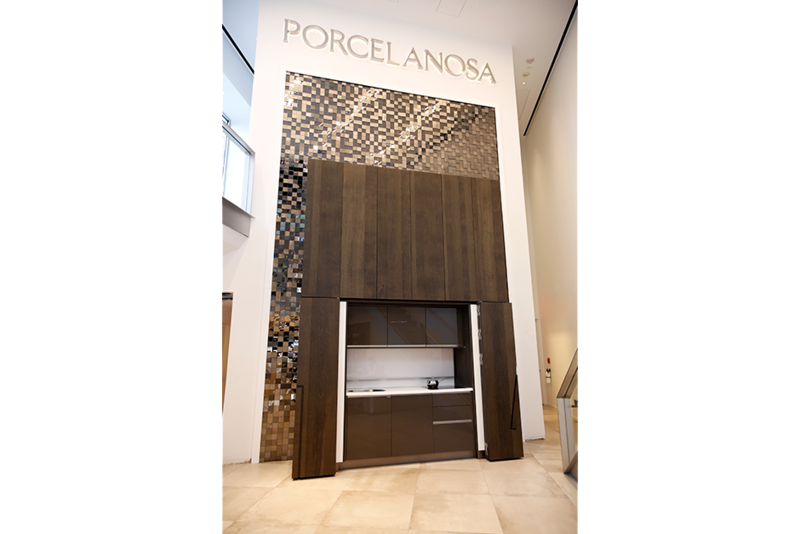 Porcelanosa is proud to announce the opening of its newly designed Kitchen Space at the New York City Flagship Showroom. The space is located in the cellar of the building and features 7 kitchen layouts. Each kitchen design was created to adhere into the many New York City lifestyles and living spaces. The Porcelanosa Core Kitchen model features a stunning backsplash mosaic design using our new Metal Acero Anthracite 3D Cubes tile. It can be seen from the first floor of the building, as it’s backsplash extends up from the cellar to the first floor. 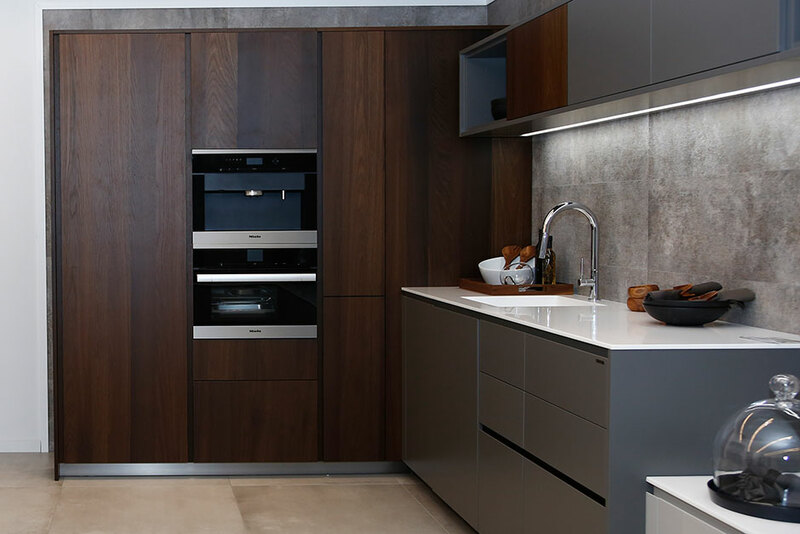 This system features a unique modulation system that can be used to conceal the kitchen, and has an exterior wood veneer finish and interior laminate finish. Its appliances have been built into the left and right sides of the design, making it a great space saving solution for a multitude of projects. Another kitchen design that is unique to this space is the Projects Kitchen. 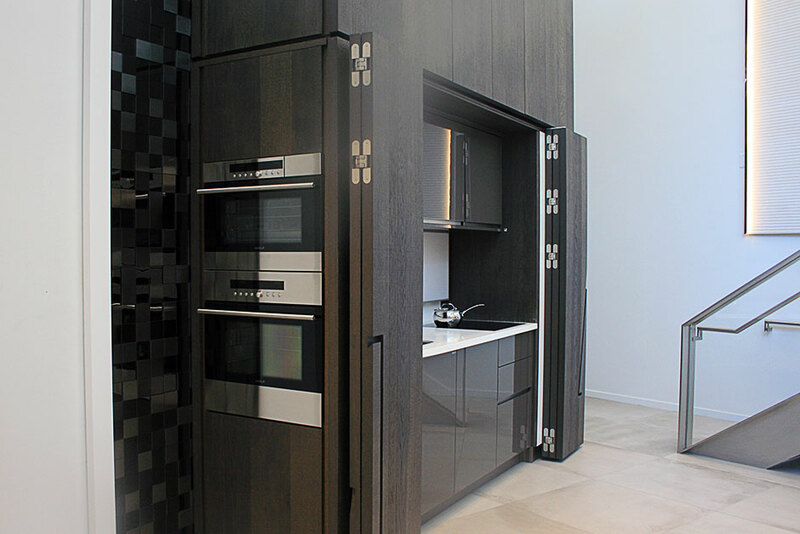 This kitchen has been specially developed for architects and designers that are working on multi-unit projects. The design features a linear layout, which can be utilized in New York lifestyles, and brings high quality for a competitive price. Porcelanosa’s new Prisma White wall tile was also incorporated into the layout. 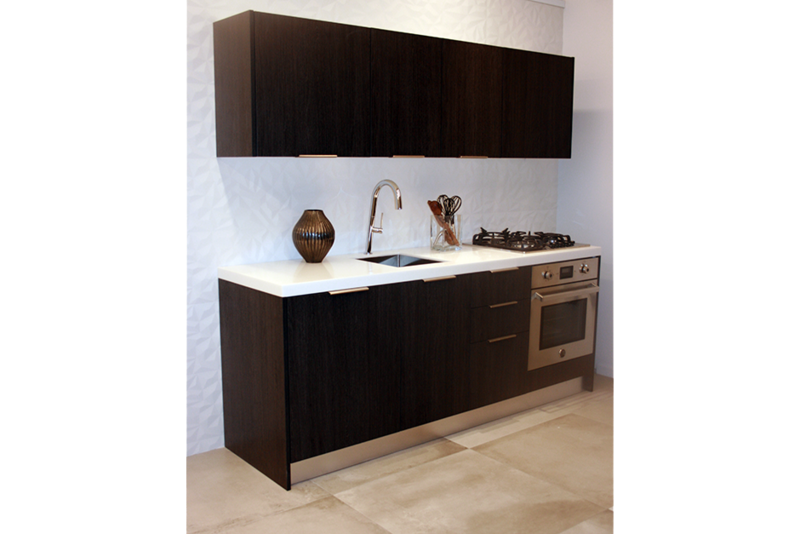 The Island kitchen design features a wood veneer kitchen. It showcases a typical kitchen style with an island, making it great for entertaining guests. The design is also available with open shelving in the back to provide additional storage and features one of Porcelanosa’s newest finishes. 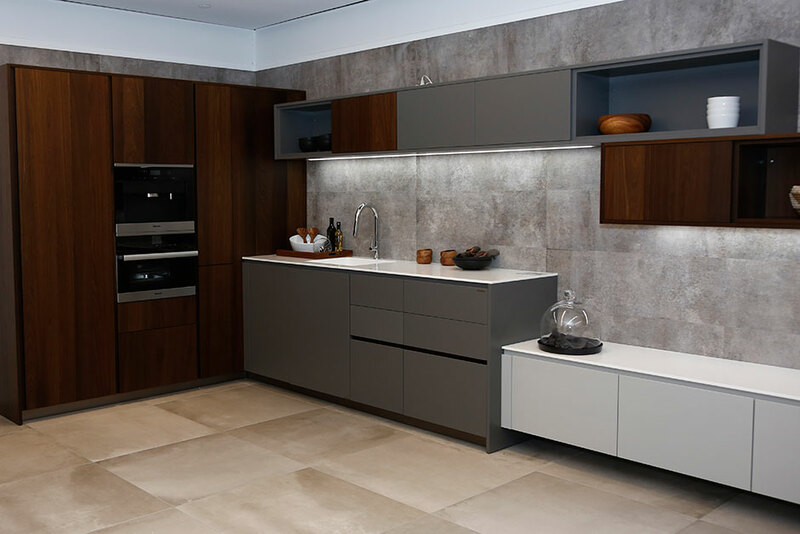 The Island kitchen is displayed with Porcelanosa’s Airslate tile. 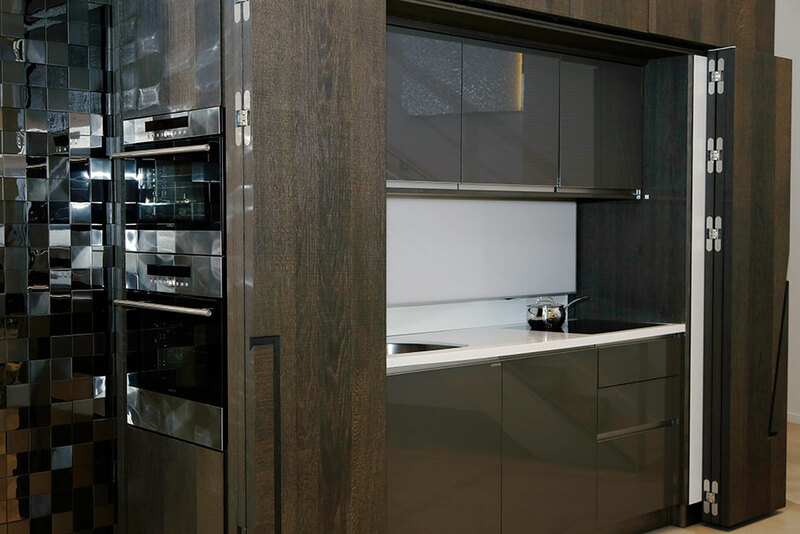 The Lifestyle Kitchen has an open format style that could be a perfect selection for anyone looking to remodel their kitchen in a New York City loft. The open format of this kitchen style is the very essence of a typical loft style apartment and utilizes some of Porcelanosa’s latest kitchen features and modern shelving designs. 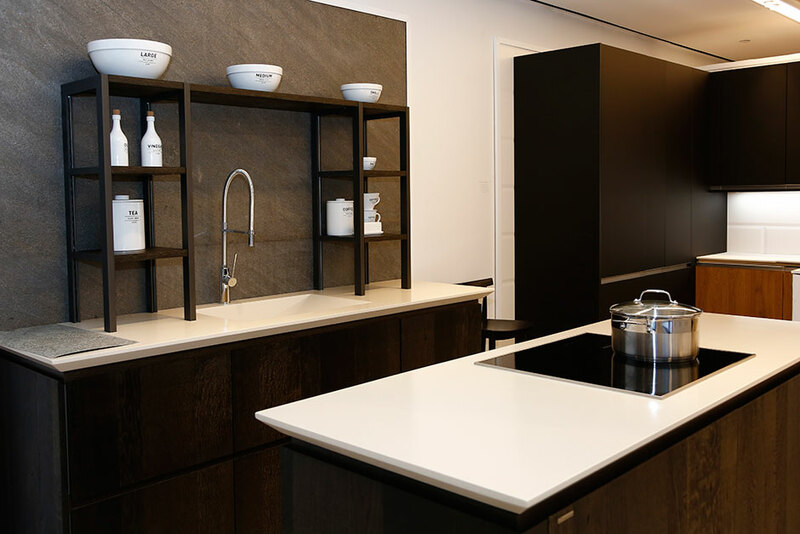 You can contact one of Porcelanosa’s talented kitchen designers to start working on your project, or stop by and see the new kitchen space at the Flagship Showroom.